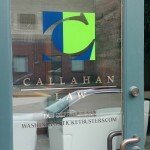 Callahan�Law is a widely known law office that serves the entire state of Washington. They have offices in Vancouver, Shelton, Olympia, Tacoma, And Seattle , which we recently did some work on with privacy window film. 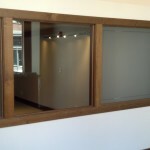 We have talked before how window film can provide privacy and design, and�that’s�exactly what we did here. 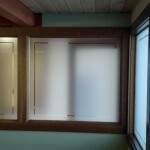 It is great at providing the etched glass look, but not�completely�permanent. To be honest I was skeptical about moving forward with�this design as it is not typical; we tend to do a clear glass reveal on the edges as opposed to what you see here, a clear glass reveal 2 inches into the pane. When we get the film up, a short dry time is needed before we can cut the 1/4 inch clear glass reveal. Once we were ready and cut the reveal… I was impressed as I saw it all come together in a uniform design – Way cool to see the process. Next was the Callahan Law Graphic, which was another thing I was not sure about. 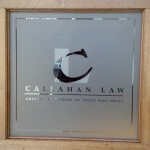 As you see in the picture the big C and other text was cut�negative, and in�order�to complete the logo we decided to overlay Frosted Crystal (a decorative film) to make the “L” (Big C and big L – Callahan Law; pretty cool design).�Generally�Dusted Crystal does not react well to a film overlay, it tends to wash out and�appear�clear. However I was unaware we had done this type of overlay before, it works great and needless to say I was impressed. The Matte / Sparkle combo was pretty top notch; it provides such a rich look and looks ten times better in person. All in all cool install and a perfect match to their business and�building�architecture.